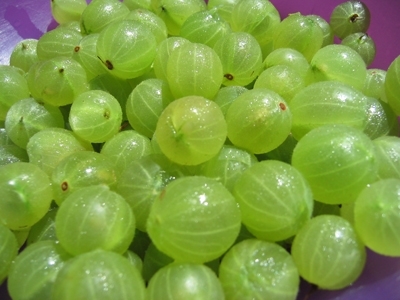 Healthy U-Akansha : Being Indian About Gooseberry-Wonders of Amla! Being Indian About Gooseberry-Wonders of Amla! Indian gooseberry or more popularly called as Amla in India, is one those miracle fruits which have all the good things to give you minus the harmful effects. A nectar for all age groups, amla is a panacea for many a illnesses. It is the richest source of Vitamin C, which has the unique property of being stable even after vigorous processing owing to the presence of tannins. And this is not something that has sprung up out of modern day research, the wonders of Amla are also mentioned in the age old mythological scriptures and vedas. It contains more than 80% of water i.e around 88.8% of Moisture moreover protein, carbohydrates, fibre, minerals and vitamins including calcium, phosphorus, iron, carotene, Vitamin C, and B complex. It also contains Gallic acid, which is a potent polyphone. The fruit is fibrous in nature. It is the richest natural source of vitamin c.
Ok, What does One benefit from it? Strengthens the liver- Regular use of amla helps purify the blood and support the functions of the liver. Nourishes skin and hair- Amla enhances natural beauty. It is excellent for nourishing the skin and delaying wrinkles. Its long-term use imparts luster to the skin. Local application helps too. That's the reason why hair creams and shampoos boost of containing amla in them. Acts as an antioxidant- A rich source of antioxidants, amla stabilizes free radicals and enhances immunity, thus helping to reduce diseases and slow the aging process. Supports cardiovascular system- It nurtures the heart, blood and circulation. Amla juice can be had as a mid meal drink. It lowers cholesterol and strengthens the heart. Enhances fertility- supports the reproductive systems of both men and women and can help overcome difficulty in conceiving. Helps diabetics- Amla juice with honey is excellent for diabetics. It helps regulate sugar level in the blood. Relieves toothache- Amla juice mixed with camphor and applied to the aching teeth, relieves pain within no time. Detoxifies, Detoxifies Detoxifies- cleanses the body, improves blood circulation and removes toxins to give you a great health and a glowing skin. So next time around skip your regular cola drink and opt for a healthy amla juice. your body will thank you for this.Also for those of us who think amla juice is yuck to have, try to spike it up- mix lemongrass, amla, lemon papaya and a dash of salt. you'll love the combo! #Word of caution: Amla contains oxalic acid, so patients with history of oxalate stones should not take it.